Creativity, innovation & beneficial change flourish. Communities like the clusters of bamboo stand strong together. Livelihood programs that become community-based cooperatives. 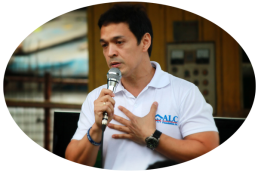 Founded by Allan L. Cristobal, chairman of ALC Holdings Co., Inc. in 2007, the ALC Foundation, Inc. (ALCF) is a non-profit organization that began with an advocacy towards education and literacy for underprivileged youth. In 2009, Typhoon Ondoy (Ketsana) devastated Metro Manila and surrounding provinces in just a few hours of extreme and heavy rain. The raging floods swept away thousands of lives and damaged properties worth millions. During the height of the typhoon, Cristobal noticed from afar, a cluster of trees by the riverbanks that were able to withstand the floods. When the waters subsided, he was able to confirm that indeed, the bamboo grove remained strong and standing in the aftermath. This incident made Cristobal realize that the bamboo could serve as lines of defense and help in controlling floods. It sparked his commitment to research and explore, together with bamboo experts in the country, how bamboo could protect the environment and mitigate the effects of calamities brought by typhoons. Thus ALCF grew to include initiatives to help underprivileged communities that are most vulnerable to climate related disasters. Since 2013, ALCF has made significant contributions to its partner communities in 17 planting sites in Metro Manila and Luzon, by planting over 20,000 bamboo saplings as core crop for propagation. A catalyst of change, creating difference by empowering communities to become responsible stewards who respect the integrity of creation and protects the dignity of mankind for God’s greater glory. Help reduce the ill effects of climate change by planting and maintaining bamboo clusters along riverbanks, mountainsides and open spaces. Transform cities’ riverbanks to Sustainable Eco Parks. Develop livelihood programs that will then become community-based cooperatives. Send underprivileged and deserving students back to school, through the proceeds from the foundation’s livelihood program. We are an organization where everyone is appreciated and judged based on their contributions and performance rather than gender, race, religion, physical abilities, sexual identity, or socioeconomic condition. Through the work of this organization, we will both create awareness of, and work to eliminate, individual and institutional discrimination. Individually and as a team, we hold ourselves to the highest professional standards. We demand the best of ourselves in everything that we do. In providing services, we are committed to proficiency, reliability, and excellence in all aspects of our conduct and performance. We foster a climate in which creativity, innovation and beneficial change can flourish. We share ideas, skills and knowledge and encourage continual learning. We value teamwork and collaboration, and the diverse strengths and perspectives of others. We are committed to respecting the rights of each individual. We value the diversity of people in the community and serve all with equal dedication, respect and fairness.